Del Monte Is In For a Hell of a Fight! Thank you for your Solidarity! 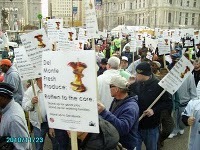 November 22 Day of Action in Philadelphia, Florida and Texas to protest union busting by Fresh Del Monte Produce N.A. Inc.